3 Bedroom Semi Detached House For Sale in Alva for Offers Over £120,000. 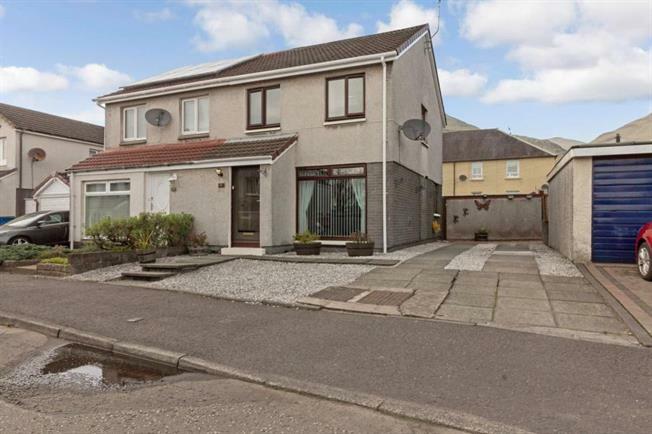 A superbly presented 3 bedroom semi detached villa enjoying an enviable position with stunning views to the Ochil Hills and nestled within the town of Alva. Brookfield Place is a popular residential area made up of similar property styles and is convenient for all local amenities. Nearby road and rail networks allow ready access to the most important business and cultural centres throughout Scotland. Ideal for the first-time-buyer, internally this well presented home comprises of an entrance vestibule, lounge with picture window to front, dining room with French doors to garden, kitchen with useful under stair storage cupboard and door leading to the rear garden. On the upper level are three bedrooms, with two offering fitted storage and a modern family bathroom. All rooms are tastefully presented with warmth provided by a gas fired central heating system and double glazing is installed. Externally, there are neat and well kept garden grounds to the front and rear. A driveway to the side of the property provides buyers with ample off street parking. An enclosed garden to the rear is mainly laid to lawn with patio and shed. There is also an outbuilding with light and power providing a superb study/games room.